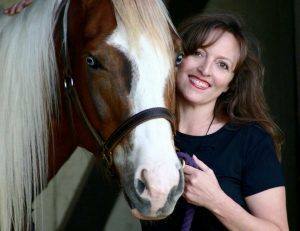 In 2001, Marla Steele came out of the psychic closet and became a professional animal communicator with the helpful nudging of her Arabian horse. Her approach to animal communication contains a blend of intuition and energy healing with Reiki, (pronounced Ray-Kee), flower essences and aromatherapy, bringing peace and comfort to the body, mind and spirit of pets and their people. A far cry from her degree in Broadcasting, although she quips that now she is the medium! Marla has authored a series of animal reference charts and a guided meditation cd teaching others how to deepen the bond that they share with their pets. She has been featured regularly on several radio and tv shows throughout the country including hometown favorite, KZST for the past 12 years. Matt Fannin introduced our solitary visiting Rotarian, Ed Smith of the Russian River Club. Julia Holewinski (a college student) was introduced by her father, Peter Holewinski. Our other guests included: Koree McLea, Rick McLea (of McLea’s Tires), Dyan Foster and Peter Foster and Linda Cade and Carole Ellis (it was not clear who hosted these guests, but we were glad to have them). Past President Debi Zaft reported that Nancy Bello, the wife of our late Past President (1990-1991) and Past District Governor Larry Bello, passed away this week. This is definitely a cloudy, rainy day. There will be a memorial service for Nancy on Tuesday, June 23 at the Star of the Valley Catholic Church (the time is tbd). Karen Ball invites us to a Club Family Social and Bocce Ball event at De Meo Park (go west on 7th Street about 2 blocks past Starks restaurant) at 5:30 PM on Wednesday, June 17. There are picnic tables and our Club will provide finger food (no, not fingers in the food), soda and water. Other than that, it’s BYO. Let President Mark know if you will attend by e-mail to President 1415@santarosarotary.com. Jackie McMillan gave us the good news that we have over 700 riders for the Giro Bello event and she expects about a thousand in total by the event date. We need more sponsorship donations and she needs help with labeling boxes on Thursday, June 25. Emily Harrington did her part, but Tim Delaney didn’t pull the winning white marble in today’s raffle drawing. He even wore a white(ish) shirt to coax it out, but it wasn’t having any of it. Tim walked away $10 wealthier (take that and invest it! ), but still a little blue. The raffle pot will start next week at $129. If everyone wears white next week (outerwear that is), maybe that marble will feel less shy about coming out of the bag. President Mark gave us an opportunity to keep current on our Club semi-annual fines. Say watt? John Poremba was so charged up, he gave a $100 gift to the John Brown Veterans Memorial Scholarship Fund of our local Foundation after his five-day visit at the golfer’s heaven – Bandon Dunes (OR) golf course. $100 is par for that course. Roy Thylin, taking today’s program to heart, was simultaneously happy and distressed that he had to sell his 1971 reconditioned Porsche sports car. It prompted him to donate $50 to the Club and $50 to the John Brown Fund. Tim Delaney went to Maui and rode (coasted) a bike down from the top of Haleakala Crater to its base, leaving no carbon footprint other than maybe some tread marks on those turns. For that thrill, he gave $100 to his Paul Harris Fellowship. For the honor of having his daughter get a job with the U.S. Geologic Society and receive a prestigious scholarship, Craig Meltzner cheerily gave $100 to her Paul Harris Fellowship. Robbie Fouts was overjoyed to receive a surprise gift of two Burning Man tickets. He gave $100 to the John Brown Fund. 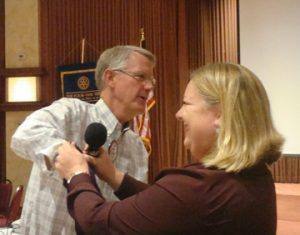 Visiting Rotarian Ed Smith donated $10 and announced the upcoming Rockin’ on the River music event in Guerneville. Ginny Scales Medeiros, author of the book “What is Normal?”, actress and a board member of Zap Auto company and Scott Dupont, producer/director of the movies “Who Killed the Electric Car?” and “What is the Electric Car?” and author of the book by that same title were our speakers, as introduced by Wayne Rowlands. Ginny and Scott have converted their driving habits from gas-powered vehicles to electric-powered vehicles and they shared separate stories about that. Ginny focused her comments on the cost savings of having an all-electric car. She gave up on her Mercedes Benz that was costing her about $1,000 a month and got a Zebra electric car in 2008. Her monthly operating costs went to $20! She receives electric rate benefits by charging her car’s battery at night during low demand time, she gets an insurance discount and State rebates that makes leasing an electric car very affordable. 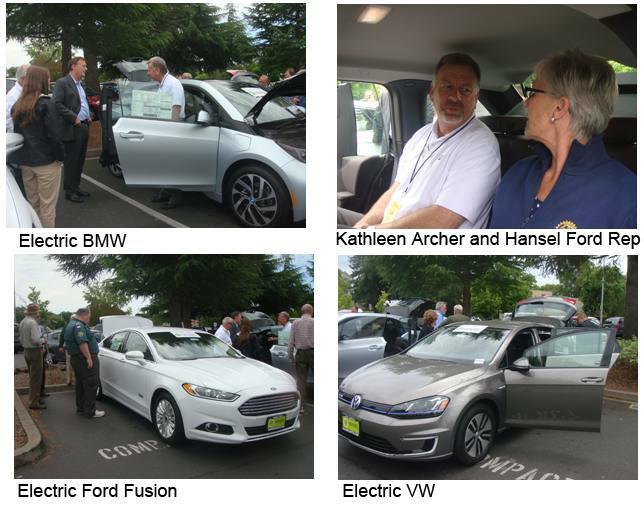 Scott spoke to the fuel efficiency of the electric car and he answered many questions from the field. He arranged to have several auto companies bring their electric models to the Flamingo Hotel parking lot for our inspection. (Some members appeared to be sitting in the passenger seats chanting “ohm-ohm-ohm” instead of “vroom-vroom-vroom”). Scott handled questions on spent battery disposal (through remanufacture to reuse), how “e-cars” will probably pay a government fee in the future to make up for lost gas tax revenue and when the rebates will probably end. He did not speak to the disadvantages of owning an e-car. He promoted no particular make or model, but did say that GM’s Chevy Spark plug-in e-car gets 75-80 miles per gallon (equivalent) and is using proven technology, so why not get one? (Ed. – so who needs an e-car? You do, if you have an electric razor, electric toothbrush, file your tax returns electronically, have an electric lawnmower and electric guitar or bug zapper). WORD JUMBLES FOR THE DAY (hint – names of e-car models). Answers in next week’s Bulletin. The last one is a fake. The koje is on you. Ha, ha, the editor gets the last gulha. Greeters Debi Zaft and Jack Geary, Ticket Sellers Gesine Franchetti and Peter Holewinski, Ticket Taker Richard Lazovick, Raffle Miss Emily Harrington, Mic Jockey Jack Geary, Scribe (yours truly). A moment of silence was observed for the passing of Ann Gospe’s mother. Keep Ann in your hearts this week.